INTRODUCTION: Both benign and malignant splenic masses are uncommon with the former being found in 0.007% of autopsy specimens. Little has been reported on the use of laparoscopic surgery for the management of splenic neoplasms. We reviewed our single institution experience of laparoscopic splenectomy in patients with splenic masses. METHODS: A database of laparoscopic splenectomies and our institution’s electronic medical record were reviewed to identify patients who underwent surgery for splenic masses and with a confirmed pathologic diagnosis of such. Patient characteristics and clinical data were then extracted from the medical record, tabulated, and analyzed. Means were calculated for continuous variables, and the two sample, homoscedastic, two tailed student’s t-Test was used to compare means. RESULTS: 74 patients (pts) with splenic masses were identified in our series between December 1996 and July 2009. The female: male ratio is 39:35. Average pt age is 58±14 years (range: 20-78 years). The mean BMI for our patient sample is 26±5 Kg/m2 (range: 19 – 41 Kg/m2; n=68). Laparoscopic surgery was attempted in all 74 pts and the procedure was completed laparoscopically in 54 patients. The hand-assist technique was utilized in 7 (9%) patients, and 13 (18%) required conversion to open surgery. Mean splenic size was 1309 cm3 (n=71). The mean splenic weight was 624 g. The main reason for conversion was large splenic size (7 pts). Bleeding (in 5 pts) and stapler problems (in 2 pts) were also a cause for conversion. Spleen size and weight in the converted to open group (2517 cm3; 1334 g) was much larger than the laparoscopic or hand-assisted group (1033 cm3; 474 g), p <0.01. Overall, mean length of stay (LOS) was 4.1±3.7 days (range: 2 – 28 days), and the LOS was not statistically different between the laparoscopic and open groups. 18 patients had a benign pathologic diagnosis confirmed. The remaining 56 patients were diagnosed with malignant masses. The most commonly diagnosed benign masses post-splenectomy were Hemangioma and Littoral cell angioma. Non-Hodgkin’s lymphoma was the most common malignant diagnosis and was seen in 49 of the 56 patients with malignancy. Other malignancies included: Hodgkin’s lymphoma in 2 pts, myeloma in 1 pt, and various metastases to the spleen in 4 pts. The odds ratio of conversion to open surgery in the case of malignancy is only 1.08, 95%CI [0.3,4.4]. There were only two wound related complications reported in the series. Both were wound infections: 1 occurred in the converted to open group and 1 in a patient that had laparoscopy with a hand-assist device. 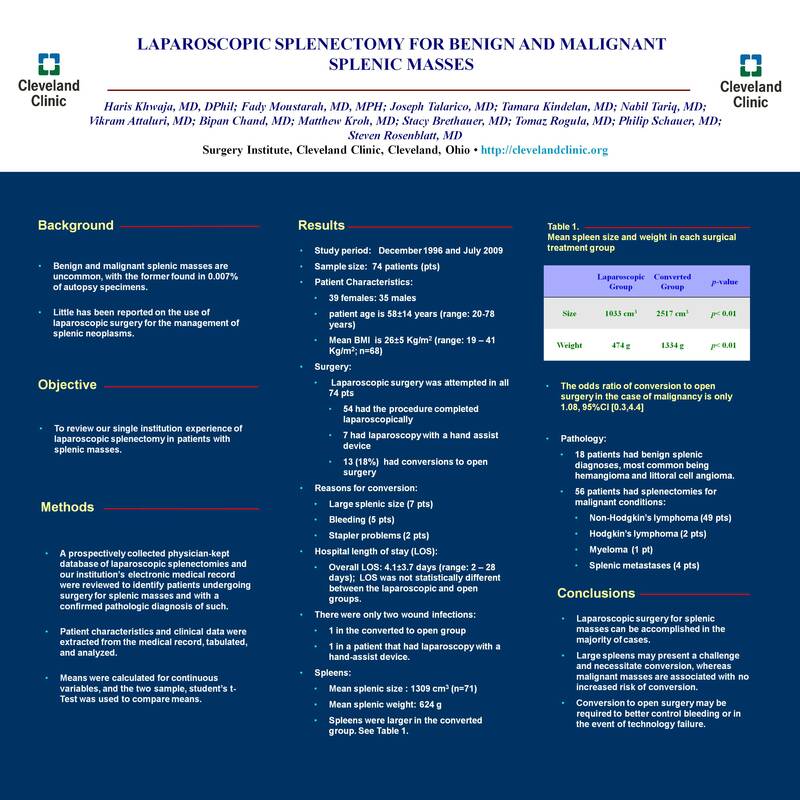 CONCLUSIONS: Laparoscopic surgery for benign and malignant splenic masses is safe, feasible, and can be accomplished in the majority of cases. Large spleens may present a challenge and necessitate conversion, whereas malignant masses are associated with no increased risk of converting to the open technique. One must be ready to convert to open surgery, however, in the event of uncontrollable bleeding or technology failure. Also, this review supports known findings that wound complications are more common with open surgery compared to laparoscopy.